Discussion in 'Jelly Bomber' started by keithburgun, Dec 17, 2017. Hey everybody! Guess what - the Jelly Bomber BETA begins today. - Fully functional gameplay. The objective is to clear the board of all fruits before you fill up the well. 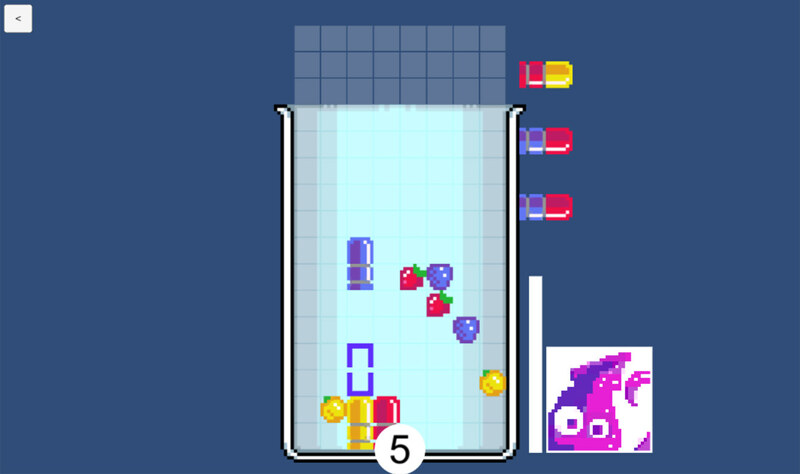 - With each fruit you clear, more jam is created at the bottom of the screen. However, jam also settles every X turns (that number in white at the bottom of the screen). - Three fruits, each of which does their own special power when cleared. - Strawberries WILL do something cool but their power is currently DISABLED sorry! - Three playable characters! Each has their own special power. Gain points towards being able to use this power by getting FRUITLESS COMBOS and by clearing Apricots. - Bunny Girl has a NUKE that destroys 2 whole rows of stuff, while creating some PITS. - Characters also have different RATES of how quickly they can use their ability AND will later have a PASSIVE ABILITY. - Play with a keyboard or any gamepad, also you can play multiplayer by having other controllers press a button during the game. Play multiplayer why don't you? - The jam pushing everything up means the tension curve should always stay high, rather than curving off. So anyway right now we just want your basic, overall opinions. There's no art yet, and everything's rough. But what do you think overall? ENJOY! richy, Nomorebirds and NickMakesGames like this. This is so exciting! Will try and play some tonight. Blackberries represent DEFENSE because they slow the tempo, by increasing the JAM SETTLE RATE when you kill 'em. Apricot represent ECON because they give you XP but they don't really disapppear (they become PITS). did a quick few plays. Played a lot of Dr. Mario on my Gameboy back then™. Right now i think it's not different enough. A thing that i would try, that would make this feel very different is to think about how and if you could remove the placing mechanism. What if you could position pills freely in a drag & drop way? I seem to have a bug with selecting one player mode (not to rule out the possibility I'm being stupid). The first player menu, which appears to be for keyboard control, can be quit out of fine; the second player menu, which seems locked to 'JS2' input and has preset values for right, left and down, cannot be quit out of; it seems to be detecting a controller which doesn't exist. My guess is it's reading an input from some other peripheral? I noticed when I pressed a key on my actual joypad a third player box appeared so it seems to respond to inputs by creating a new player for the game. I was going to say the same thing. It has strategic additions but the same old physical mechanism of navigating blocks down and through gaps into supported positions is still very much up front and dominating gameplay. Are you confident players will stick with it for long enough to see that it has more depth than whatever their current fave block-dropping game is, and for them to consider JB as an alternative? I played 4 matches. My thought process in all was 100% on trying to make rows and not let the pile get over the top of the screen. It may as well have been Tetris. I had no thought for strategy or jelly theme, and I even know they're there!! How much faith do we have a right to expect from new players? I doubt Joe Gameplayer will give more than 5 minutes to see something interesting before moving on to the next thing, unless they're a Dr Mario fan, and how many of those are there really? Similar to what TTT suggested, I think it would help if the strategy could be made to shine through more prominently, since that's the USP. To impose a look-ahead cap you have 4 visible upcoming pills, but also an effective turn time limit. Are both necessary? I think stuff like the planned Story Mode and local multiplayer will help a lot with this. I don't think Joe Gameplayer plays any game at all for purely the mechanical interactions of rules, they play for a feeling of visceral fun, they like the theme, the atmosphere, the characters, they like how the dopamine feels in their brain when they get satisfying audio-visual feedback. I agree that getting someone to play a game for more than 5 minutes is one of the biggest hurdles for game developers, and something Dinofarm should certainly consider important, but I also have a hunch that initially hooking a player is rarely determined by the actual depth and quality of the gameplay. You have to pull players in with other stuff. Look and feel, a promise of more stuff to discover, stuff of that nature. the same old physical mechanism of navigating blocks down and through gaps into supported positions is still very much up front and dominating gameplay. Avoiding that isn't something we're going for. I like Dr. Mario, and our goal is to make a better Dr. Mario. I'm not going to make it different just to make it different, but if there are suggestions that just make the game better without making it too much harder to learn or feel weird or anything, I'm all for those. Auro was a game that wins forum debates. This is a game that's designed to make people want to play it. I don't think players think much about "depth". I think they more think, "do I like this theme" and "is this fun to play on some basic sort of level". Those are the things that will hopefully draw them, and then they will be exposed to the more-depth without ever realizing it. Just as people will switch from Overwatch to League of Legends and have no real idea that one has any more depth than the other. My thought process in all was 100% on trying to make rows and not let the pile get over the top of the screen. It may as well have been Tetris. A big thing that's missing now is the single-player Elo. You have to kinda play around with the ranks to find one that's hard for you, but not too hard. Try rank 8-9-10 or so maybe? Hopefully at that level you will be forced to actually use some strategy. Interesting that you see 4 incoming pills as a cap on lookahead cap - to me that's a LOT of incoming pills. I would probably suggest we make that lower if anything, down to just 2, maybe 3. But are you suggesting we have like, some limitless amount of those? Or how many do you suggest we have? Seems really bad to me to have any more than what we have now. But yeah I think pretty much every game has the hurdle of getting someone to play for more than 5 minutes. Just know that this is like the super alpha-ey version. There will be PRODUCTION VALUES later, cool art, fun music, etc. Bunny Girl's power is the best I think. It's just super powerful, especially if you save it for the end game and use it to clear the last few berries, which are by far the hardest to get when playing other characters. I wonder if making it a big "circular" explosion, rather than the entire 2 rows would be better. It would make it's downside (that it's 3 tall and can't be rotated) more important, so you'd have to be smarter in how you set it up maybe, and it wouldn't be so effective at easily ending the game. Squid Boy's power is okay. Seems like the weakest at the moment though. It's hard to set up properly and has a kind of small pay off on average (a lot of times only destroying 1 or 2 blocks). Though I can imagine set ups where it results in big combos, so balance wise it's probably what you want from an ability. Elwood has by far the most interesting power, but it has the unfortunate downside of being like too complex for me to use correctly while playing. If you can get the right set up with it you can get huge combos, which is awesome, but I just played a game at rank 8 where I never used the power because I was too afraid to mess up. The jam line was really high and any mistake was probably going to end it for me, I had so little space that I didn't have time to calculate out how to use the power to the best effect. That will probably change with practice though. NickMakesGames and keithburgun like this. they play for a feeling of visceral fun, they like the theme, the atmosphere, the characters, they like how the dopamine feels in their brain when they get satisfying audio-visual feedback. I think they more think, "do I like this theme" and "is this fun to play on some basic sort of level". Those are the things that will hopefully draw them, and then they will be exposed to the more-depth without ever realizing it. No arguments with any of this stuff. Downplaying the strategy angle and going for PRODUCTION VALUES for this kind of game would seem to be a plan to go head to head with Bejeweled etc., and why the hell not?! Those games are massive sellers! Bejellied here we come - can't wait! Incidentally a level timer like Bejeweled is IMO a more player-friendly way of limiting thinking time. It's less intense and panicky than it being on each move (or effectively applied by gravity). Hey how about if there was a level timer, but when you steer your blocks around you can also steer them *upwards* instead of them relentlessly falling. But if you steer a block upwards 'against gravity' the level timer runs down twice as fast? That would also add a twist tactically by opening up the possibility moves where you'd 'fly round the bottom' into position. Jelly Bomber is super fun! I think it's a problem that thinking-time decreases as the well gets filled. Maybe the pieces should hover in the three extra lines for longer depending on how high the jam level is. I seem to have a bug with selecting one player mode (not to rule out the possibility I'm being stupid). The first player menu, which appears to be for keyboard control, can be quit out of fine; the second player menu, which seems locked to 'JS2' input and has preset values for right, left and down, cannot be quit out of; it seems to be detecting a controller which doesn't exist. Bunny Girl's nuke def. has a lot of problems. You don't usually need to think too hard about where to place the nuke, which makes it kinda boring. You just select the lowest column and place it there for maximum effect every time. The other issue I'm just now realizing is that it has maybe too wide-reaching of an effect. If you're looking at columns 3, for example, it seems a little weird for your bomb to be able to reach things in column 8. It hits too many things to realistically plan for / react to in a single turn. I think a more focused explosion is a good idea, maybe something that just effects tiles adjacent to the cells that the nuke occupies? Squid Boy and Elwood's powers could certainly do with a bit of beefing up, as well. That's not a bad idea. I think the bomb fall subtly slower in the death-zone than it does in the main well could be nice. It should probably be a constant modifier, though, and not grow more generous just because the jam line has come up. HairMachine and keithburgun like this. Can you tell us a little more about your current computer setup? It sounds a bit like something I've seen while testing controller support. If you have a wireless PS4 controller synced to your machine and also have it connected via a USB cable, it will register as two different controllers, one of which seems to always be pressing down on the triggers. I'm not sure if this happens with other wireless controllers, but if you have them near or attached to your computer, it may be worth trying to manually unplug / disconnect them. This is totally belated but I figured out the issue - I had a logitech wheel plugged in via USB. The wheel itself was disconnected from the power source and wasn't actually starting, but it was still being picked up as some kind of dead interface you could never interact with. I didn't test playing Jelly Bomber with a steering wheel, which I now regret. Some, though not all, other apps were also confused by this; though for them it was doing an assortment of other weird things (such as disabling keyboard input). Anyway probably not something for you to fix! Thanks for the reply! no problem. Thanks for following up with that information. I never would've guessed that a stray steering wheel was the culprit, haha. Last week we had an ALL DAY STREAM! It went really well. Our goal is to "finish the game" - like make it sort of bare-bones releaseable - in one more all-day stream, which we're working out the details of now. But generally it's going really well and I think we'll probably have the game "done" within about a month. Blake has been making some phenomenal looking (and sounding) work for the game. HairMachine and Nomorebirds like this.